This item (V59510) is not currently available for purchase. The magic of shooting stars can happen every night when you add them to your Christmas lights display! This vibrant, animated motif features energy efficient, cool white LED mini lights with twinkling bulbs at each end to add a shimmering effect! The highly durable, long lasting construction of our professional quality motif's makes them a great choice for many Christmases to come! 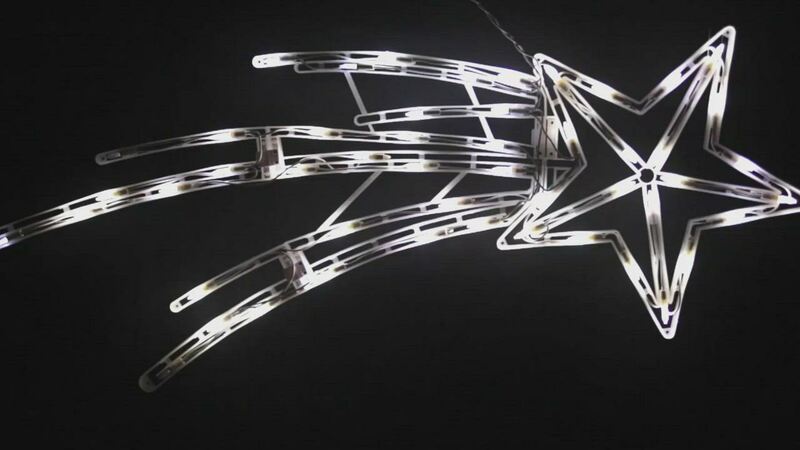 Hang this dazzling decoration among tree branches, across your front gate or on your home to create brilliant animated displays with the spellbinding effect of shooting stars! The shooting star is wonderful! It looks better than the photo and is a bit larger than advertised, which is great. The subtle flashing lights on the ends of the trail are fun and give it a feeling of being in motion. Fast shipping. Lights are nice and bright! Reviewed by Jose J C.
I don't like the color of the star. The star is not worth its price.